"Quick and easy turkey dinner." Bring water and margarine to a boil in a saucepan; stir in stuffing mix. Cover and remove from heat. Let stand until stuffing is softened, about 5 minutes. Fluff with a fork. Spoon about 1/2 cup stuffing over each slice of turkey. 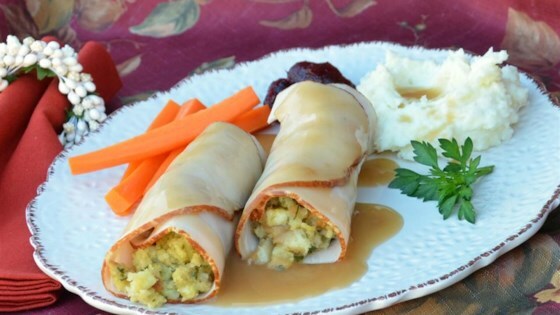 Roll turkey around stuffing and arrange rolls in a microwave-safe dish, seam-side down. Pour gravy over rolls. Heat in a microwave on high until gravy is bubbly, about 5 minutes. This is my go to fix for Thanksgiving during the rest of the year! Easy Peasy! Pick the Stove Top Stuffing you like, roll them up - nuke and dinner is on the table. I served with cranberry sauce, carrots and some leftover potatoes.